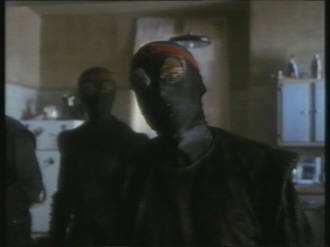 Buy the uncensored version of the film at Amazon.co.uk! 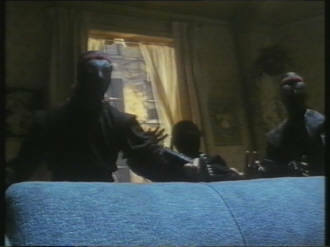 Comparison between the censored German VHS (=UK VHS, BBFC PG) by Canon and the British DVD (BBFC PG) by Medusa Pictures/Fortune Star. 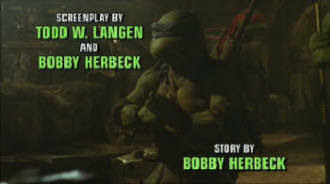 This film is based on the comics made by Kevin Eastman and Peter Laird. 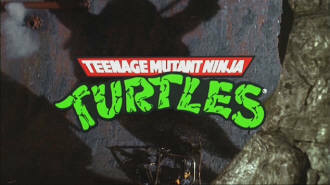 In the 80's an animated series set around the four battle-tested turtles followed but was, in contrast to the dark comics, much more harmless and designed for a teen audience. 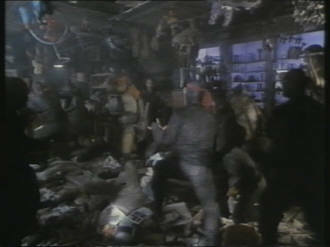 Along with that came a huge wave of merchandising. 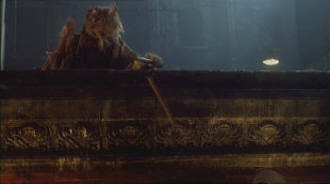 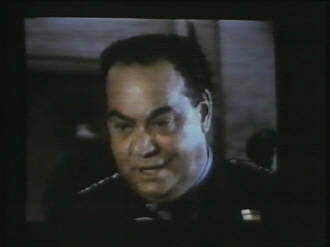 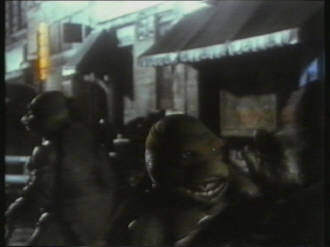 The first live-action film featured a more dark tone although it doesn't cut out the humor and has a rather trashy appeal. 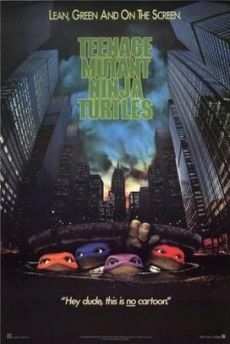 This was followed by two sequels which, however, were lower in quality, a TV-series and the first CGI-animated film (which isn't as bad as it is often reported). 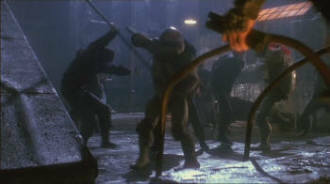 Let's focus on the different versions of the film: When it was released in 1990 different scenes, which featured martial arts weaponry (especially Michelangelo's nunchakus), were shot. 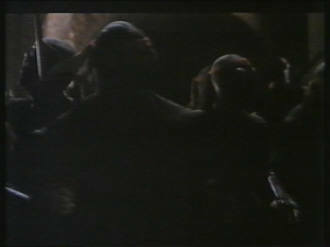 The reason for this was that showing these weapons were forbidden in the UK at that time. 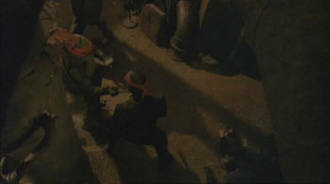 Unfortunately, the German version (which is used as the censored version for this report) is based on the British verion and is besides heavily darkened. 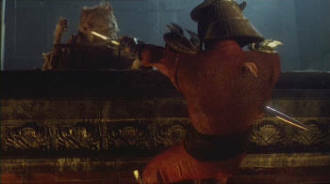 The comic sounds, which should soften the harmless fight scenes, can only be heard in the censored version. 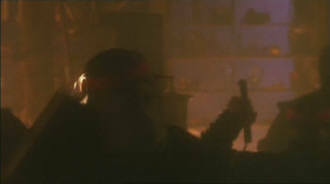 However, the British world view has changed in the past couple of years so that the local DVD release now features the uncensored cut of the film for the first time. 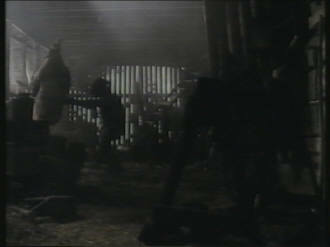 The timecodes were taken from the censored German version. 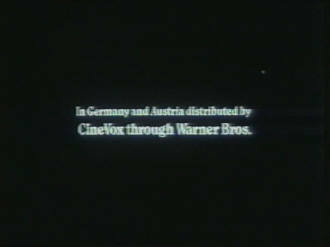 German version = 87:12 min. 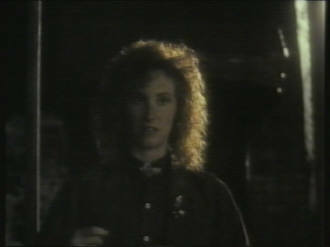 Engl. 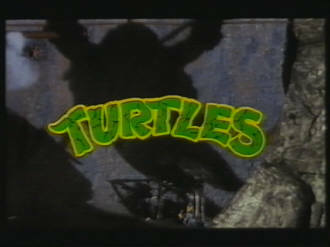 version = 89:43 min. 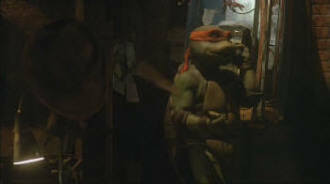 06:14-06:31 The scene in which Master Splinter lectures the turtles is a long tracking shot in the uncut version which also runs longer. 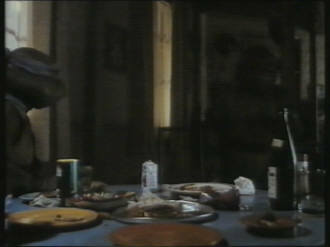 The censored version has different shots. 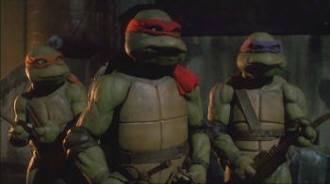 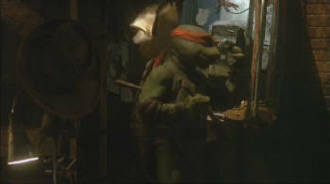 06:31 The beginning of the shot showing Donatello and Raphael is a bit longer. 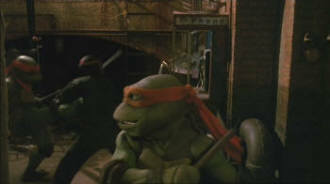 07:00-07:04 A shot of Michelangelo ordering a pizza is shot differently in both versions. 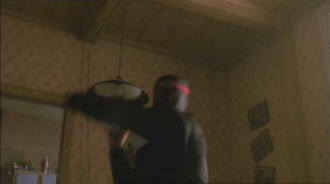 While he tosses his nunchakus in the uncensored version, he doesn't do that in the censored version at all. 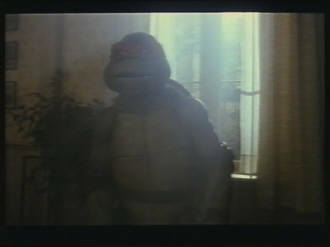 No time difference. 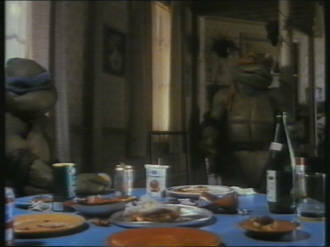 07:18-07:20 Again, a shot of Mike is different in the uncensored version. 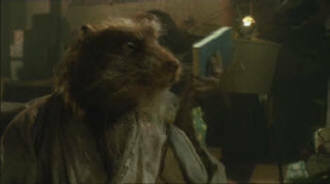 Furthermore, one sees how Splinter takes a book and throws it at him. 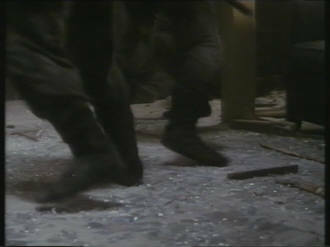 07:21-07:24 Once more, there's different material in both cuts when Mike is shown. 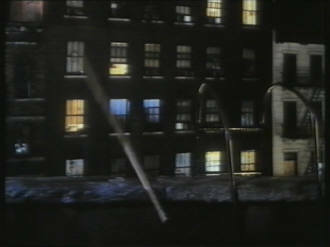 No time difference. 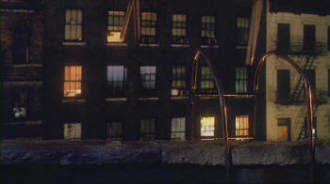 07:25-07:27 Ditto. 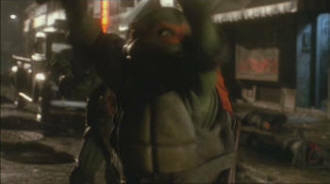 No time difference. 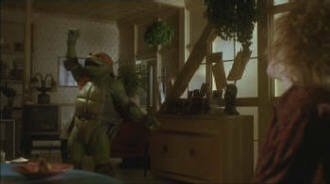 07:56-07:59 Michelangelo and Donatello dance to the music. 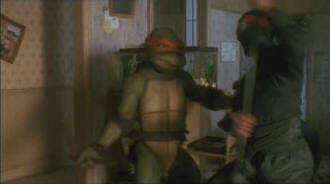 Thereby one can see the nunchakus on Mikes back protector in the uncensored version. 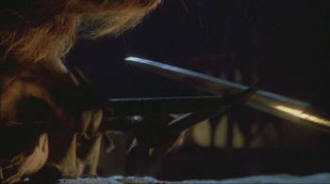 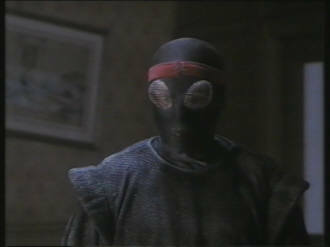 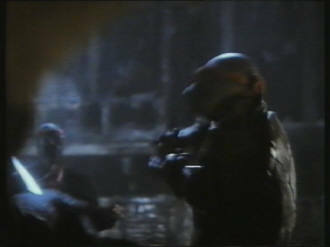 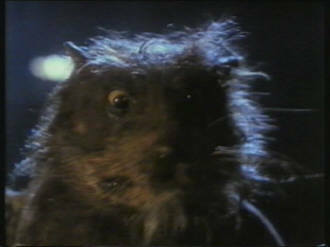 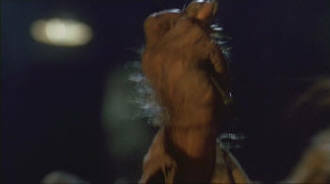 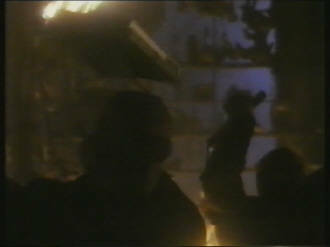 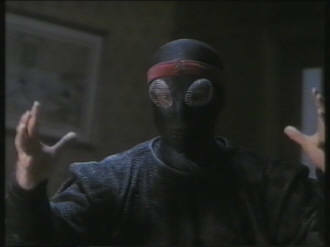 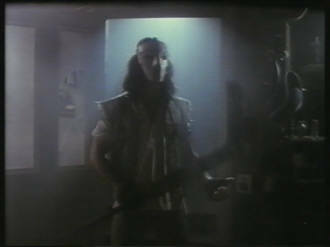 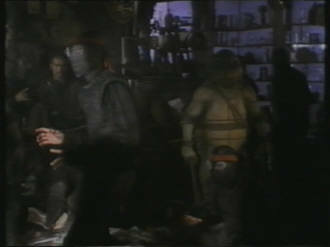 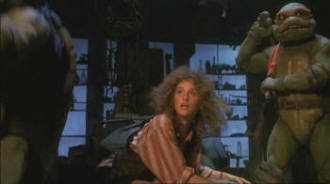 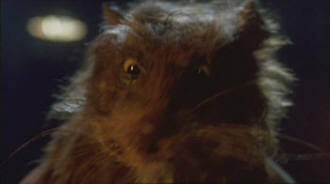 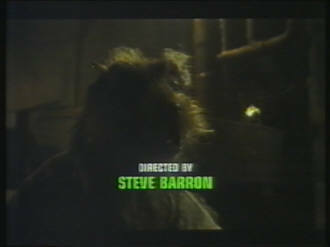 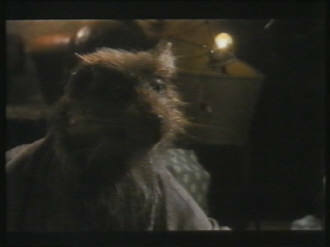 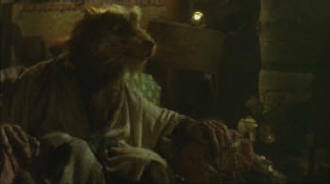 The censored version uses a different shot as well as a shot showing Splinter. 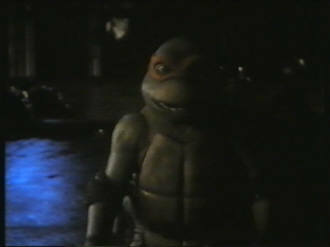 No time difference. 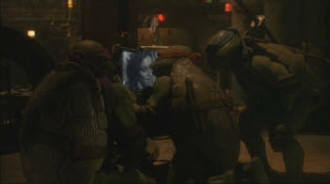 16:45-16:52 As the turtles watch the TV-interview of April O'Neil with Chief Stern, the censored version shows close-ups of the TV-screen. 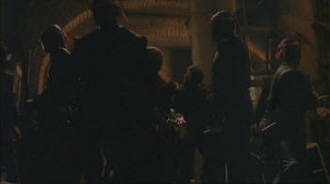 The uncensored version shows this from a distance. 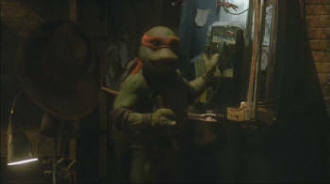 Moreover, Michelangelo bends over to the TV and kisses it as April is shown. 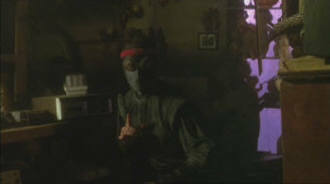 His nunchakus can be seen once more. 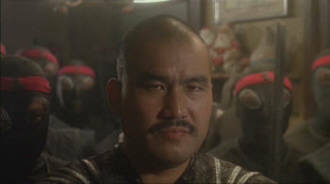 No time difference. 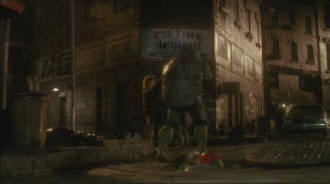 24:14-24:33 The scene in which April invites the turtles to a pizza is shown in a lasting shot which is slightly shorter in the uncensored version. 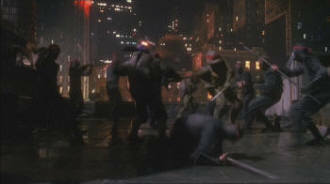 The censored version features different shots of the turtles and April. 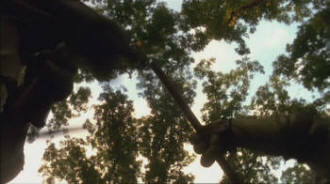 Overall, this is a bit longer. 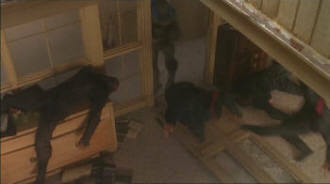 24:41-24:54 In April's apartment: Here, different material was used also. 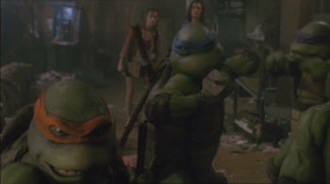 April and the others have a giggle over Michelangelo who satirizes Sylvester Stallone's Rocky-character in the uncensored version. 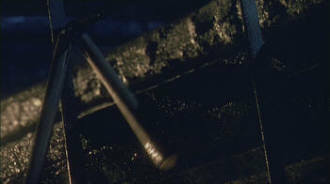 This is a bit longer. 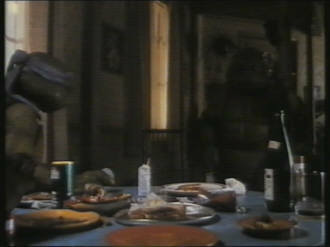 24:57-25:06 Same procedure as last time. 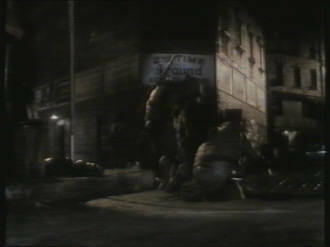 This time Mike satirizes James Cagney. 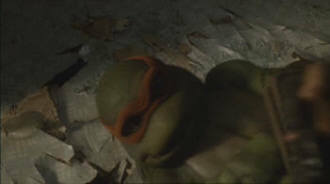 The uncensored version runs a bit longer. 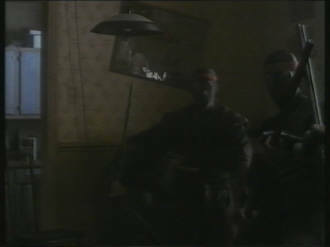 25:29 The end of the shot where Mike stands up is missing because his weapon can be seen shortly. 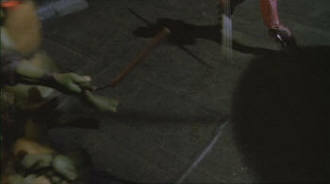 36:03-36:07 Again, scenes were shot alternatively because of the nunchakus. 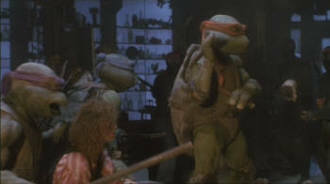 No time difference. 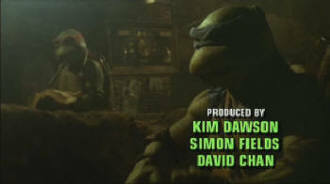 40:07-40:09 Alternate material. 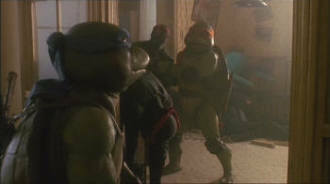 The censored shows shots of April and Leonardo as well as the foot clan. 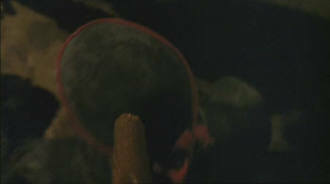 The uncensored version has a bird's eye view. 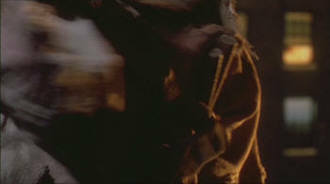 No time difference. 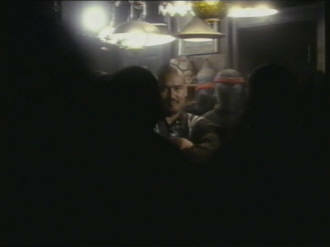 40:12-40:17 The censored version has two shots of the villains that the uncensored version does not contain. 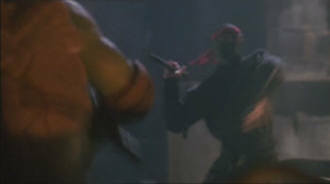 The censored version omits the end of a shot as well as a scene in which a member of the foot gang flips with a nunchaku. 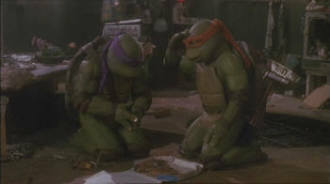 Michelangelo feels challenged and both show their skills one after another. 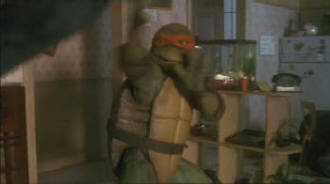 Finally, Mike lets his nunchaku rotate on his finger in a slack way. 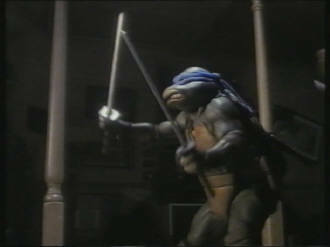 This is followed by a shot in which he holds his weapon over his head while Donatello jumps over him. 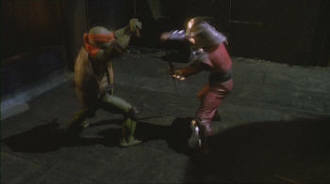 40:19-40:21 As Mike finishes two opponents with his nunchaku both versions have different scenes. 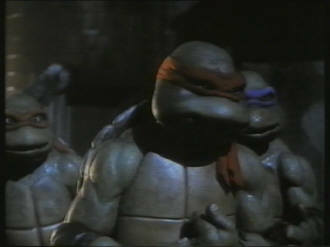 The uncensored version runs longer. 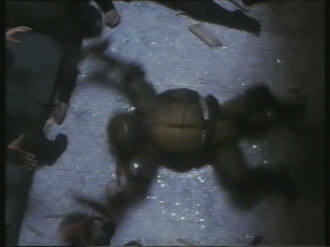 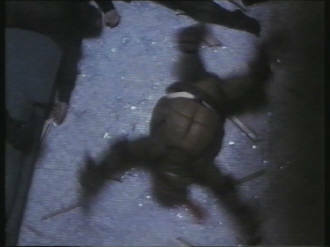 40:22-40:26 The footsoldier falls back longer after he was knocked unconscious between the shells of the turtles. 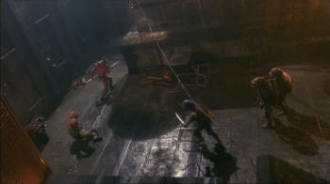 After that, there's a fight between Leo and two baddies (one of them has a nunchaku) which is shown in a bird's eye view. 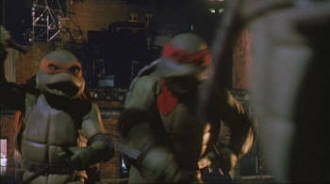 The censored version shows Leo fighting shortly and then Donatello striking an opponent with his fight stick (which is also called “Bo”). 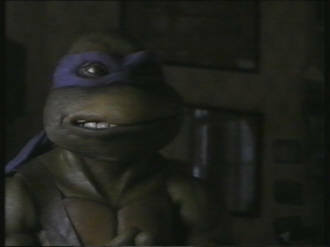 No time difference. 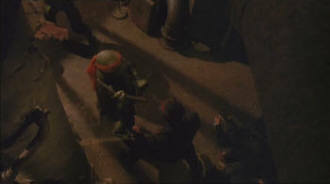 40:29-40:32 Different shots of the fight that takes place in front of April and the injured Raphael. 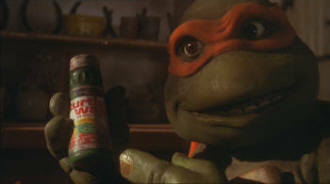 No time difference. 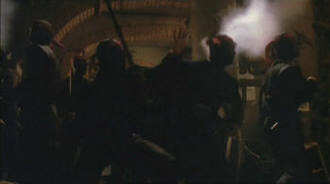 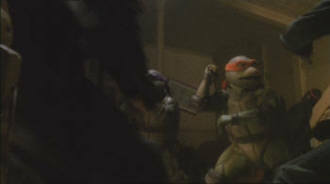 40:32-40:41 After Leo puts an enemy out of action, one can see Mike in the background saying something to him. 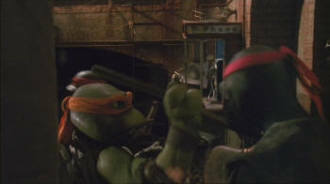 The censored version shows a shot of April and Raphael. 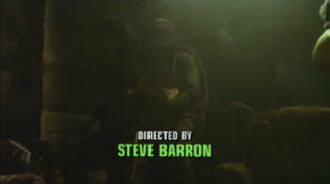 No time difference. 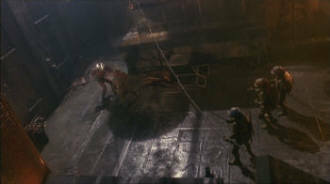 40:54-41:28 From this point, both versions have partly different shots so that it is almost impossible to reconstruct which scenes do indeed appear in both cuts and which do not. 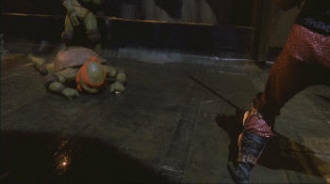 Michelangelo's move of spinning on his shell and knocking out enemies is a bit shorter in the uncensored version. 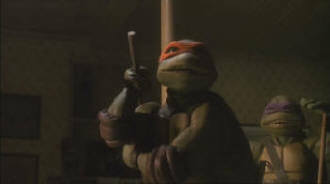 However, one can see that Don pushes Mike with his stick. 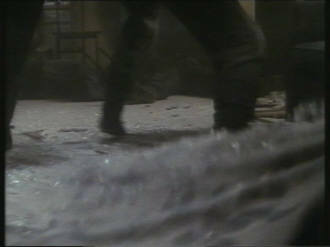 In return, only the censored version shows how April pulls a carpet away causing some enemies to fall to the ground. 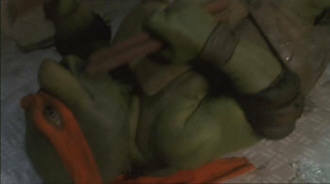 The censored version is longer here. 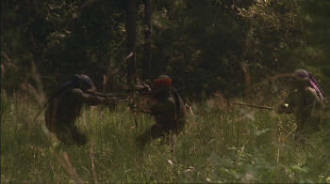 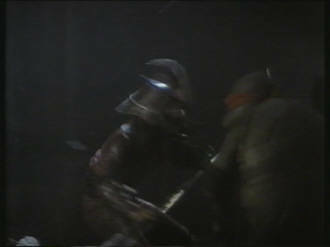 41:35-41:40 Just when an enemy tries to hit Mike with an axe, scenes were filmed differently. 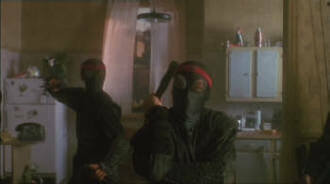 Again, this is because of Mikes nunchaku being in the picture. 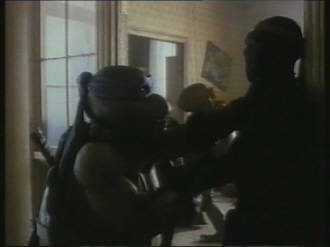 Still, the censored version is a bit longer. 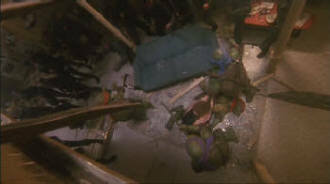 41:50-41:58 Shortly before the floor in April's apartment cracks, the censored version shows various shots of the attendees and one can hear the floor scrooping. 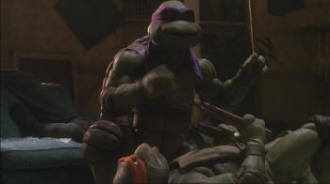 The uncensored version shows Mike and Donatello which can not be seen in the censored version. 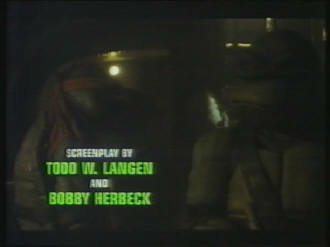 However, the censored version is longer. 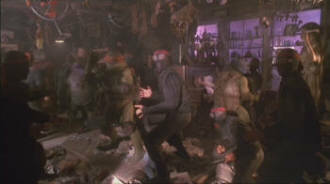 42:05-42:14 When the ceiling is collapsed and the turtles and the foot clan members are back on their feet, they meet Master Tatsu. 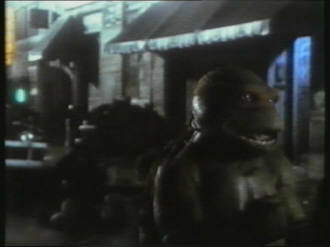 This is shown with different material in both versions. 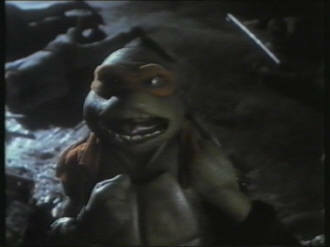 No time difference. 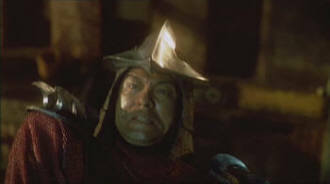 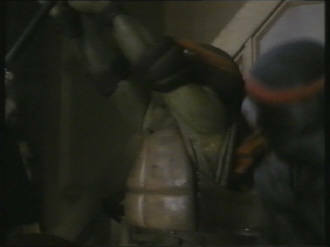 42:21-42:22 As Tatsu commands his men to attack, the uncensored version features a shot of the turtles and April. 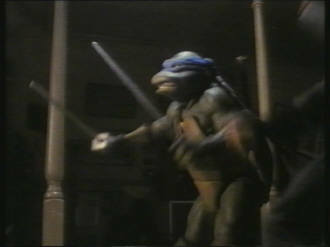 Mike stands there ready to fight with his nunchakus. 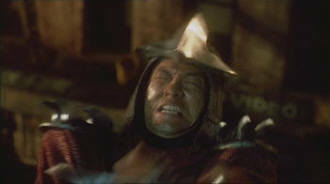 In return, the censored version shows Tatsu and the racing enemies longer. 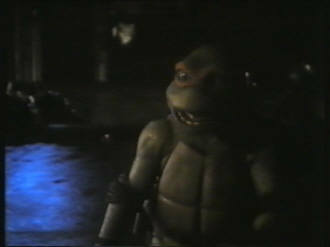 No time difference. 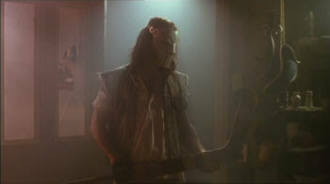 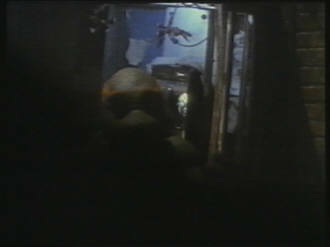 43:03-43:09 After the lights went out and Casey Jones appears, different shots were used. 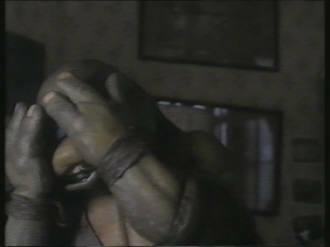 No time difference. 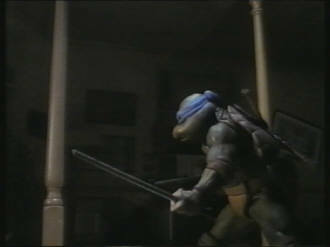 43:14-43:20 Once more, alternate shots were used because of Mike and his nunchakus. 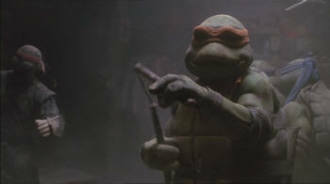 No time difference. 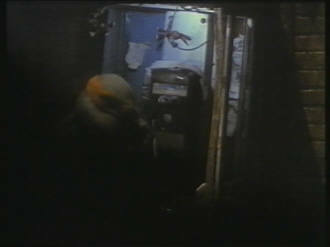 44:33-44:34 The scene in which a footsoldier is hit on the head by the answering machine was slightly changed. 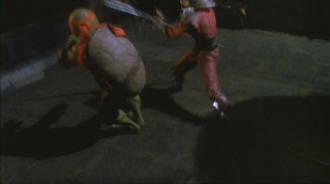 The reason for this is that the uncensored shows a villain in the background having a nunchaku. 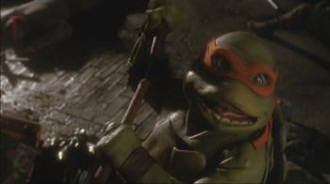 No time difference. 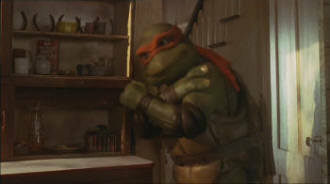 53:36-53:39 Michelangelo's boxing training is filmed differently in both versions. 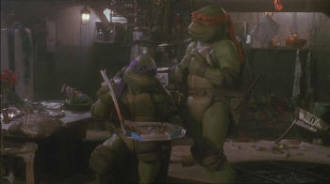 The uncensored version shows it from a nearer angle. 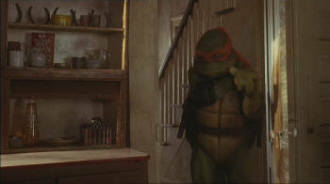 No time difference. 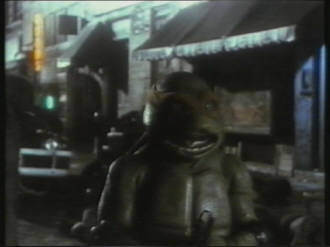 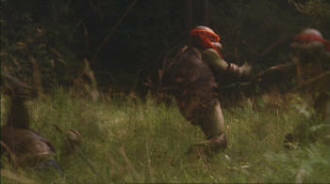 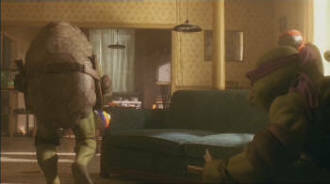 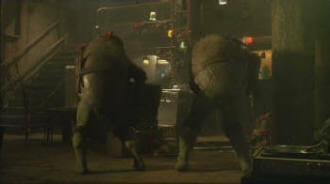 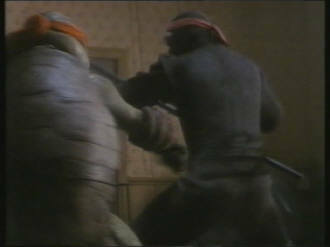 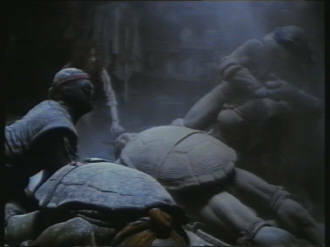 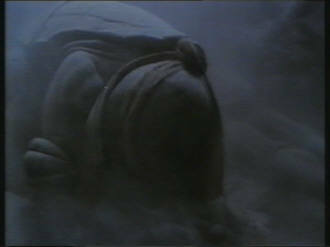 54:34 The end of the scene in which the turtles are training is missing in the censored version. 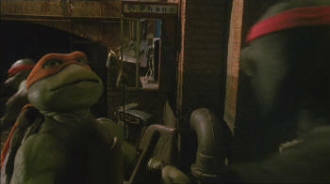 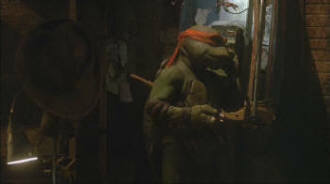 54:35 A short shot in which nunchakus and Donatello's fight stick are seen is cut (frog's eye perspective). 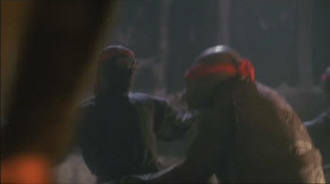 54:36 End of a shot, Mike attacks Raphael who attacks him from behind. 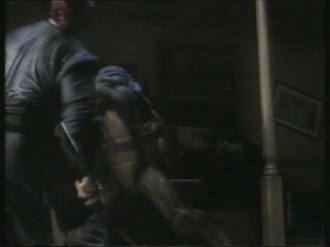 54:39 Two shots of the fighting toads and the beginning of the next shot. 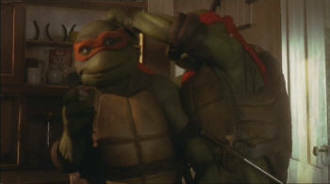 55:15 When Casey massages April's shoulders, the censored version doesn't show how Mike enters and rubs his left shoulder. 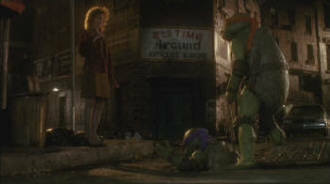 April offers him a salve but he refuses thankfully and takes a tube of “Turtle Wax” out of a locker. 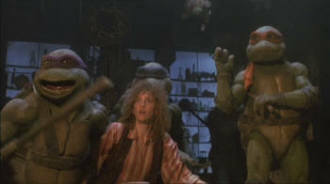 Raphael joins him and they clown around. 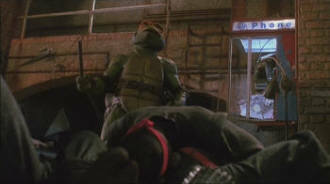 59:52 The end of a shot is longer when the turtles open the locker in which Danny hid himself. 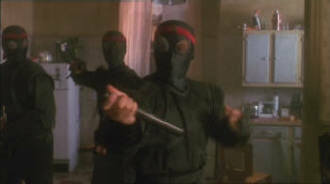 The reason is once more Mike with his nunchaku. 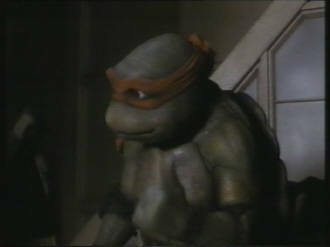 61:19 Mike stands next to Don and asks about the pizza. 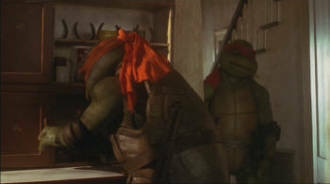 Don says that it's alright if Mike doesn't care that he would have to put penicillin on it in order to not get sick by the rotten pizza. 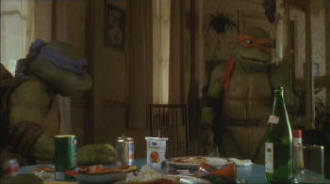 Mike is shocked and they both begin to “mourn” about the pizza. 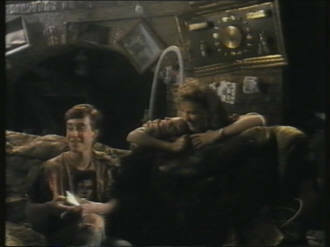 In return, the shot of Danny and April laughing about Mike is a bit longer. 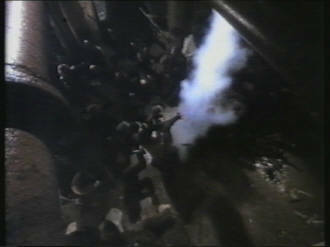 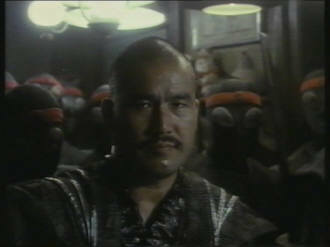 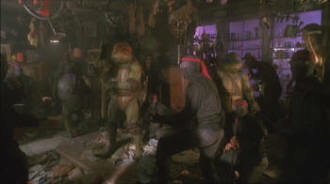 67:55-67:59 When the foot clan is scalded in the steam in the turtle's hideout, different material was used. 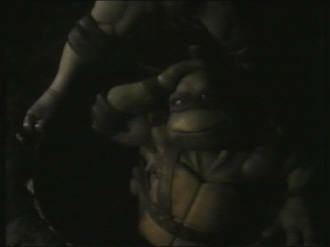 The uncensored version shows this in one whole shot while the censored version has some more. 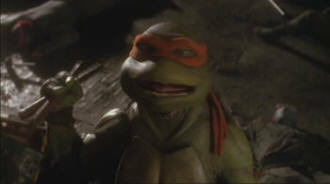 No time difference. 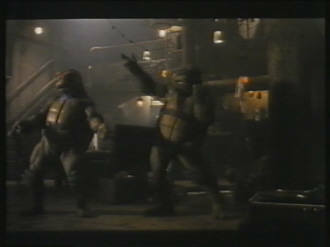 68:11-68:22 After the steam is gone, the uncensored version shows the turtles standing among the finished enemies from the bird's eye perspective. 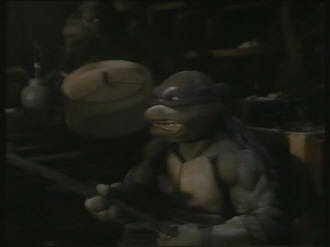 Mike acts with his nunchaku. 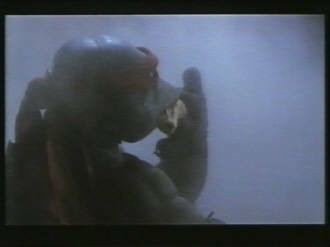 The censored version shows different shots of Raphael eating an apple as well as a shot from above. 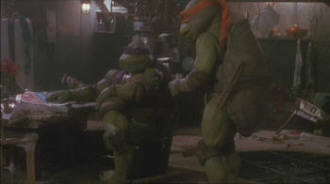 No time difference. 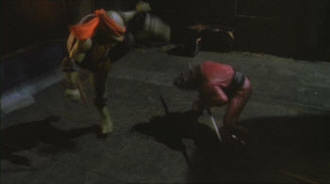 69:15 April is on a heightened position watching Mike fighting an enemy with his nunchakus and lets a pole hit his opponent at the right moment. 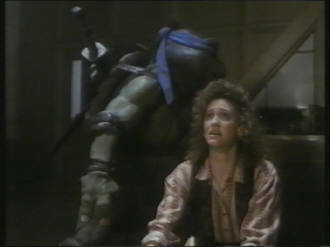 The enemy gets knocked out and Mike tells her that she's a natural talent. 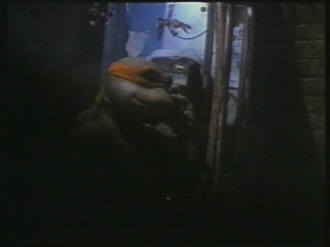 71:56 End of the shot in which Mike leaves the drain. 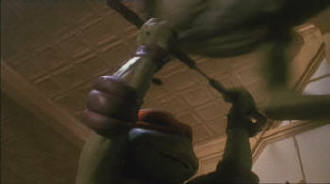 A guy tries to hit him with nunchakus. 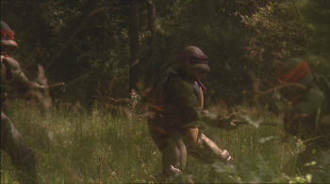 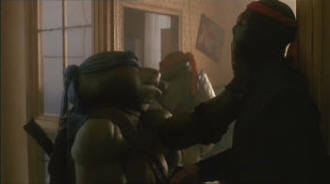 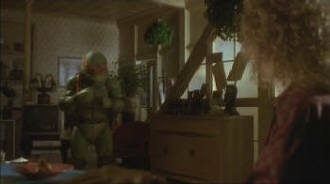 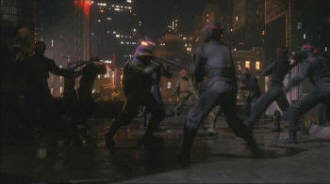 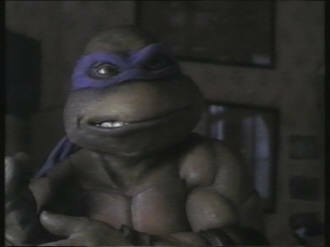 72:03-72:07 Alternate shot when Mike fights a guy and talks to Donatello while being in action. 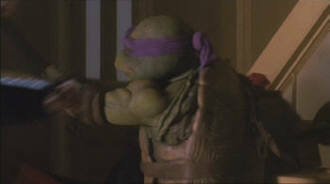 No time difference. 72:08 End of a shot in which Don blocks an enemy with his stick. 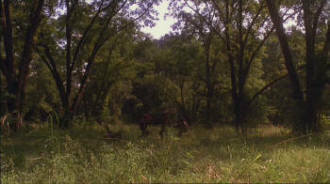 72:16-72:20 Again, there are different shots in both versions. 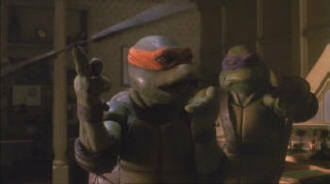 No time difference. 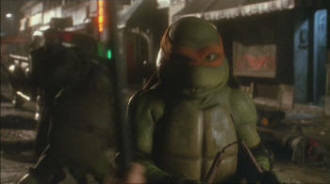 72:33-72:37 At the moment where Mike says that he loves to be a turtle, he holds a nunchaku in the uncensored version, not in the censored version. 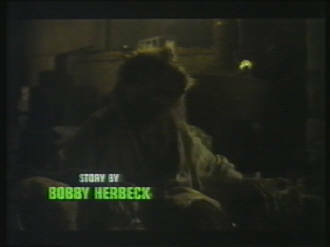 Furthermore, the uncensored version runs a bit longer. 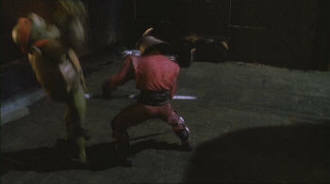 72:42 During the fight on the rooftop the end of a shot is missing because a footsoldier holds a nunchaku. 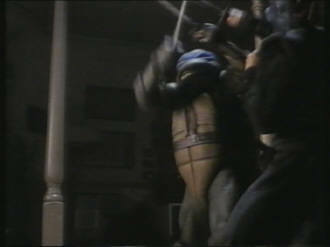 72:53-72:55 A guy attacks Mike with a nunchaku. 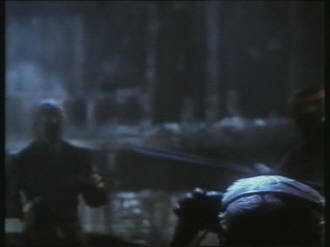 In the censored version he ducks from a blow of the fight stick. 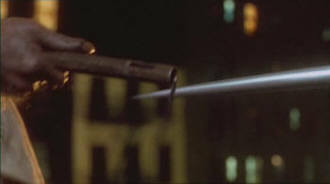 No time difference. 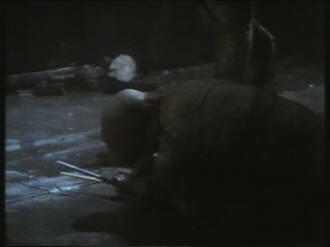 72:55 Don beats an enemy to the ground with his stick. 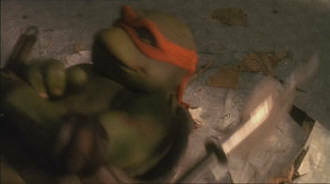 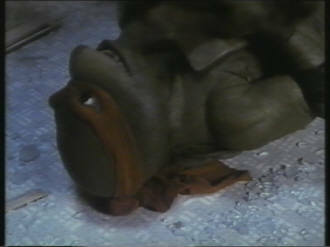 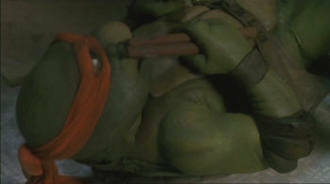 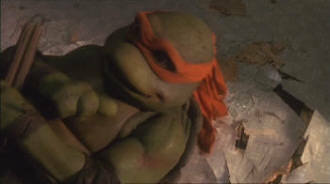 74:04-74:06 When Shredder pushes Raphael to the ground the censored version shows this in a slow motion close-up. 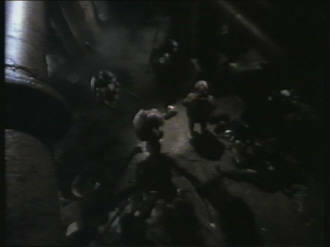 The uncensored version shows this from the bird's eye view. 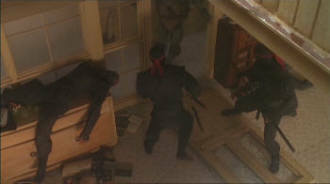 From that angle, one can see all the others. 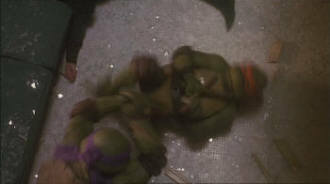 Raphael rolls on the ground, the other three turtles discuss shortly who's going to attack next and finally, Leonardo starts attacking. 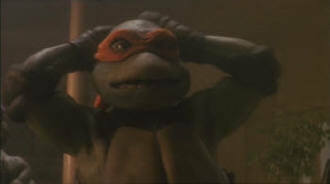 The uncensored version is longer. 74:10 The censored version omits a scene in which Mike and Donatello discuss per rock-paper-scissor who attacks Shredder (who's standing left) next. 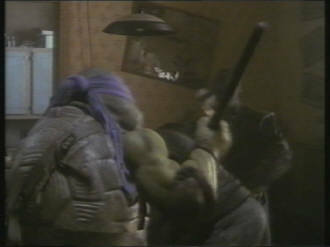 Mike loses and prepares for attack. 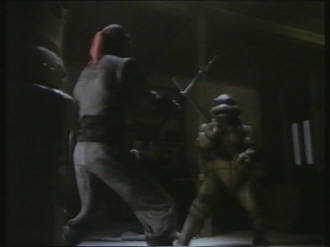 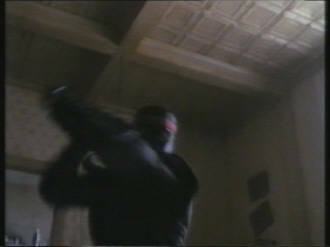 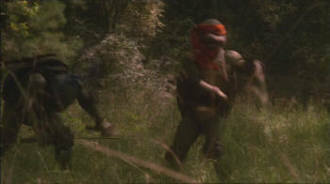 74:46 When they attack Shredder as a team, the end of the shot is missing because Mike can be seen with his nunchakus. 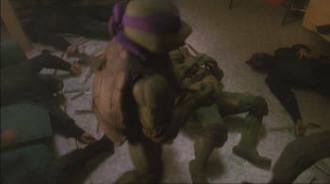 74:57 After Leo was pushed to the ground by Shredder the censored version omits how he rolls away and Mike attacks the villain. 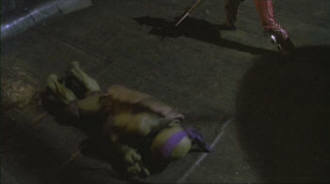 However, Mike is beaten, too, and lies on the ground. 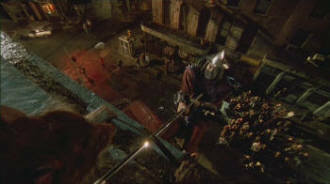 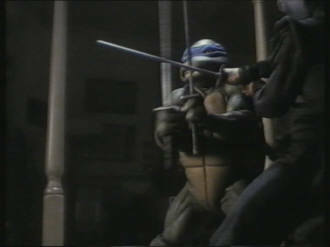 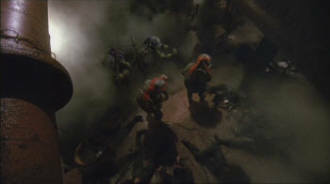 76:18-76:31 The scenes in which the turtles stand in front of Shredder and have to surrender their weapons, were partly featured with alternate material because of Mike's nunchakus. 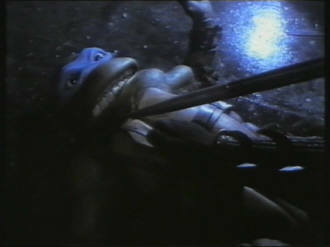 In return, the censored version shows another shot of Leo lying on the ground and having Shredder's spearhead pointed at his throat. 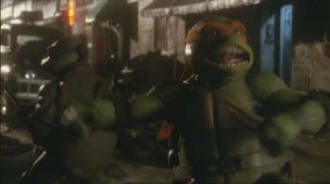 Because of this change, the censored version runs a little longer. 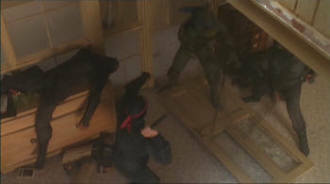 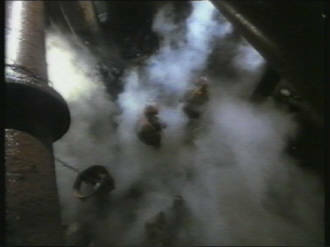 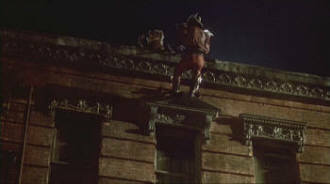 76:31 Close-up of Mikes nunchaku being caught in a ladder at the building. 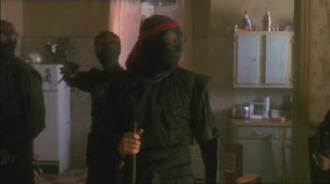 77:27-77:29 When Shredder runs to Splinter pointing his spear at him, the uncensored version shows how Splinter grabs a nunchaku, catches the spear and throws Shredder over himself. 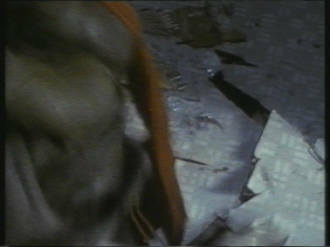 The censored version shows different material. 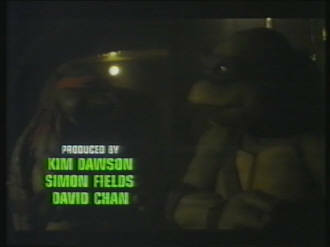 The uncensored version runs slightly longer. 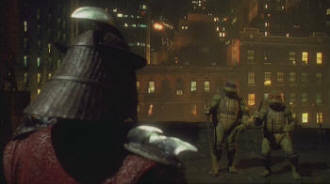 77:31 Shredder doesn't fall from the rooftop directly after Splinter's attack. 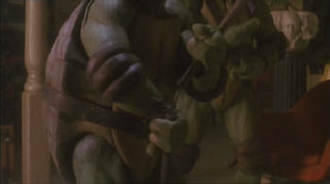 He still holds the spear which Splinter still holds with his nunchaku (close-ups). 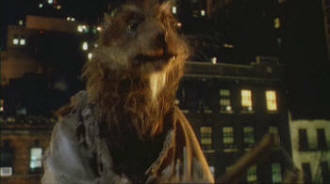 Splinter talks to his arch enemy and says that the time has come. 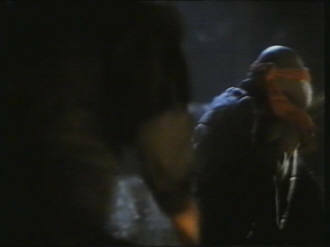 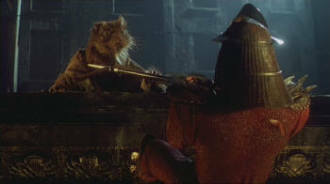 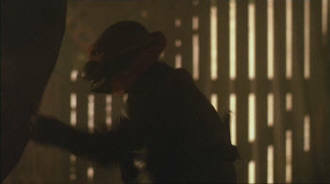 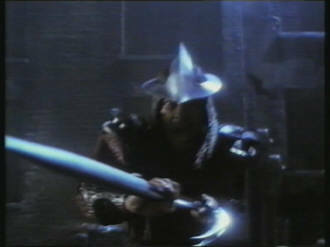 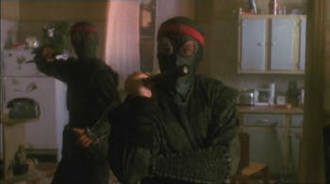 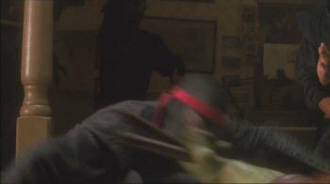 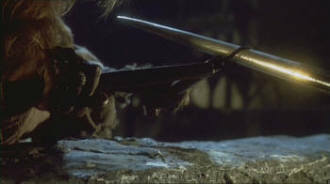 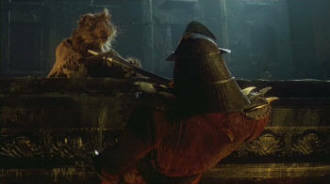 Shredder grabs a knife behind his back and throws it at Splinter but he catches the knife and releases the nunchaku (mistake in the film: although Splinter holds the knife with one hand, one can see that he holds the nunchaku with both hands in the next shot and with only one hand in the following.). 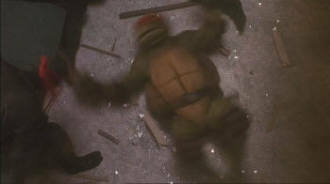 Now, Shredder falls down. 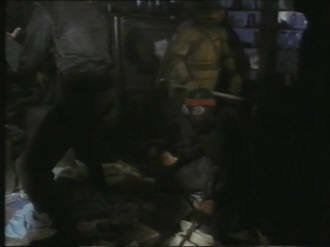 77:37-77:39 After Shredder has landed in the trash compactor, Splinter can be seen in the uncensored version ending a line from the scene before. 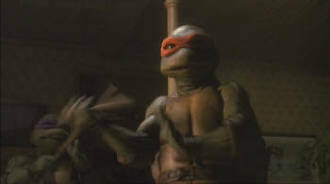 In the censored version he can be seen as well but doesn't say anything. 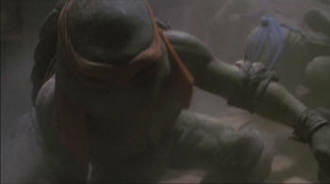 No time difference. 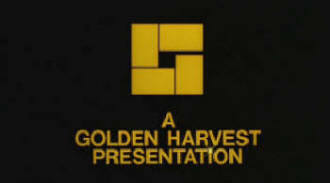 87:07 A distributor's logo can be seen in the censored version.